During the holidays I’m always looking for a way I can get the kids involved. Whether it is helping with a recipe or a holiday craft, I want my kids to get into the spirit of the season. There are a lot of thanksgiving crafts for kids, but this thankful tree is an activity that the whole family can participate in and can continue all season long. Plus it’s really cute and matches my Thanksgiving decorations! You will need a couple of things for this activity. The first thing you will need are some leaves. Print out this thankful leaf printable for your tree. If your kids can use scissors, have them help you cut them out. As you can see, I wasn’t super precise in my cutting. 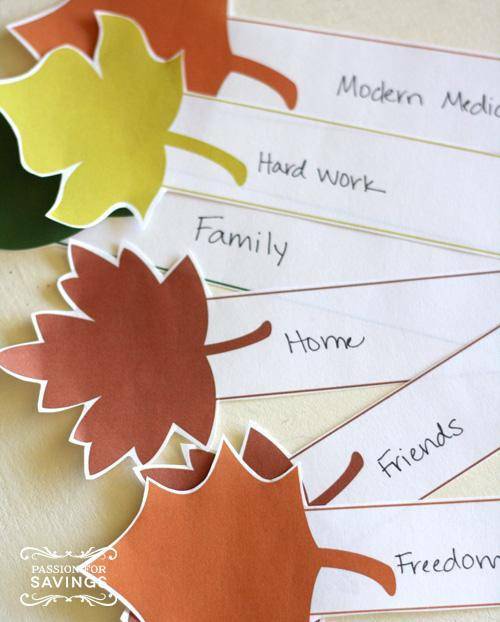 Then write down the things you are thankful for on each leaf strip. Of course you will need a “tree”. My tree is actually some lit willow branches that I bought at World Market. I placed them in a tall vase and they are the perfect thankful tree. I could’ve gone into our backyard and used some skinny branches from our tree too. Once you have your tree and your leaves, wrap your leaf strips around a branch and then use tape or a stapler to keep the leaf from coming off the branch. Of course let the kids write down some of the things they are thankful for and add it to the tree. We loved the leaves but thought it would be fun to add some cute mini pom poms to our tree too. The kids actually helped make the pom poms for the tree too. I am keeping extra leaf strips on the table so we can add things as we realize more things we are thankful for. I love the constant reminder of gratitude that this tree inspires. Plus, it looks great on my entry way table, paired with my give thanks sign and fall harvest wreath.